Language learners pass many milestones: the first café conversation, reading your first novel, being able to discuss bottling-plant manufacturing specifications with a civil engineer from Omsk. None, however, quite matches the sheer pleasure of having just told your first joke. I recently told my very first joke in Arabic. Without boring you with all the details, it was based on the fact that the words for December and January in the Levant also mean “barbecue 1” and “barbecue 2” - which obviously have no direct equivalent in English. And this is the bitter truth for any translator: when we’re balancing those difficult compromises that have to be made in turning one language into another, it’s humour that we often find most difficult. Jokes are sometimes the first thing that gets “lost in translation”. It was all so easy for Charlie Chaplin of course. Back in the silent era, a star from any country could make an international reputation – though of course certain cultural specificities did get in the way. (German films, for example, were sometimes considered a bit too dark and serious for America.) Chaplin is still a global phenomenon, so it’s heartening to know that at least visual comedy is fairly universal. Nowadays, international sales are becoming increasingly important in the film business. The Chinese market has grown dramatically, and box-office sales there are set to overtake those in the USA later this year. It’s something that has been suggested as the cause of the increasing reticence of film protagonists to speak because is saves directors the effort of having to deal with all those tricky cultural specificities. Famously, Matt Damon uttered a mere 288 words in the latest Bourne film. It’s the silent era all over again, plus explosions. 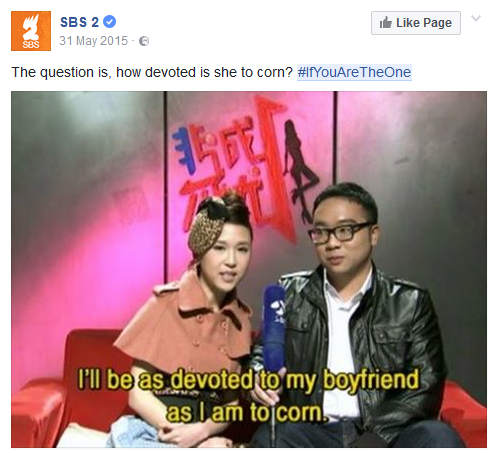 Those worried by the trend towards bland universalism should be heartened by the surprise success of a Chinese dating-game show in Australia. If You Are the One has all the elements of great entertainment in its original Chinese, marrying a proven format (based on Taken Out) with the wit and humour of its host, Meng Fei. 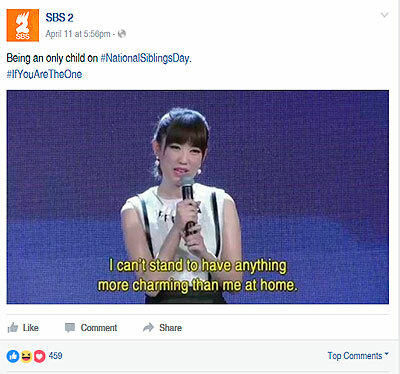 It has become a phenomenon in Australia (where it is shown every single night of the week) through the skill of the SBS network’s head of subtitling, Dr Jing Han, and a canny social media marketing campaign. Dr Han will explore aspects of her work at this year’s Languages & the Media Conference in Berlin. Getting host Meng Fei’s humour across in English is something Han describes as “a huge challenge” – but one she has clearly mastered. She has taken the line of translating his meaning as close as possible to the original, without substituting in more readily amusing English lines. It is the rhythm of English humour that she aims to emulate, “making his humour sound like punch lines … [conveying] a sense of sharpness and wittiness”. But what about those untranslatable cultural specificities? Not a problem, says Han. “Australian audiences simply enjoy some incredible differences, particularly cultural differences … Australian audiences find things fascinating that are just so ordinary to a point of not being seen by Chinese audiences.” Though the source of a considerable amount of humour, these differences also get Australians to learn more about Chinese culture. 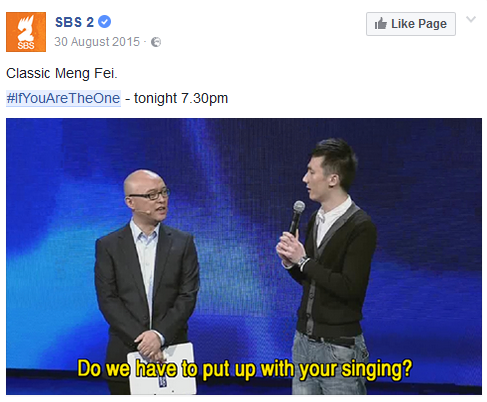 Ideas of context and relevance underlie the social media marketing of If You Are The One: “sayings in the form of subtitled screen shots can be re-interpreted out of original Chinese context and in the newly ‘created’ Australian context”, says Han. To pinpoint the mechanisms by which this works is beyond the scope of this article, but attendees at Dr Han’s talk can expect to be filled in. Meanwhile, I will just refer you to the accompanying images: proof enough, I think, that – contrary to expectations – comedy can indeed be “found in translation”.